I've been debating on how to blog about all the wedding things and I've decided that before I dive into the weekend events I wanted to share some of the background details leading up to the big day. So let's just cut to the chase. 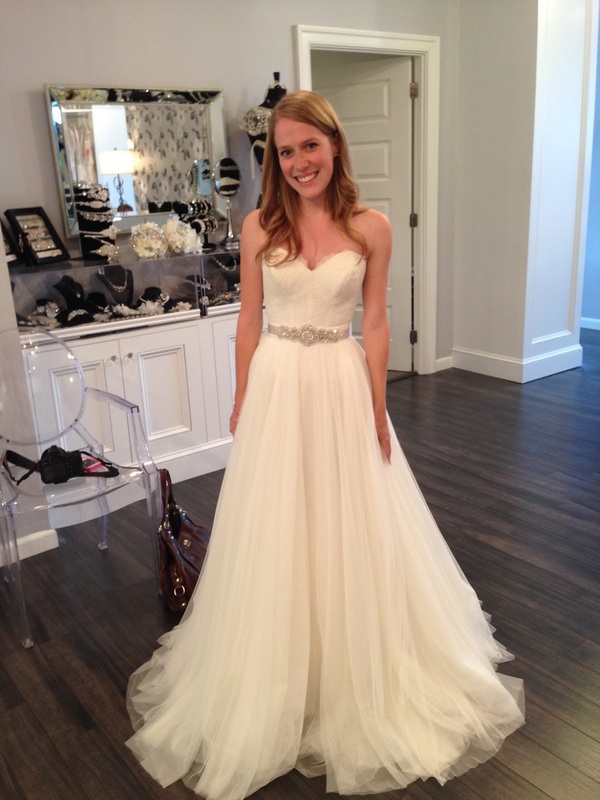 I know you all just really want to hear about my wedding dress. And I'm done holding out on you. Mind, you were not the only ones kept in the dark. 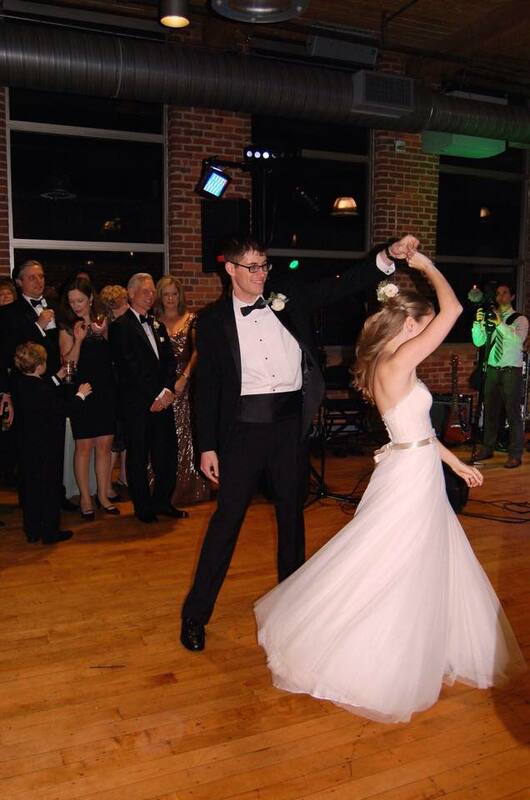 T.J. did not see my dress, or really have any clue what it looked like until he saw me walking down the aisle to him. I was really good about keeping it a surprise from most people - no easy feat. I love my dress and I fell more and more in love with it with each twirl on the dance floor at our reception and I wanted to wear it every day leading up to the day and now that it's over I still want to wear it every day and sit on my couch and eat popcorn and watch Friends. 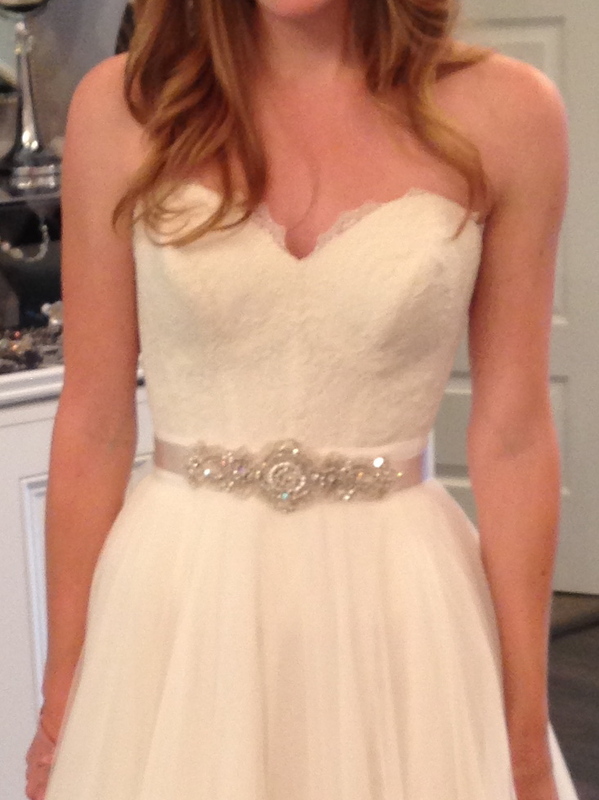 My dress was the 5th dress I tried on in the first store we visited. And it was pink, but we'll get to that in a minute. It was not one that I had pinned or seen in a magazine and just had to try on. In fact I didn't even pick it out, our assistant brought it into the dressing room and said it seemed like something I would like. Going in I said I wanted a natural waist, something flowy and romantic. I didn't like the trumpet skirts or the super fitted look or something too "typical". I also didn't want a huge ball gown or something that would overwhelm me and make me look like a little girl playing dress up. These were my favorite "inspiration" pins that I had in mind when I set out shopping. So after trying on a couple pretty dresses that just weren't me, the sales assistant brought in my dress. And, like I mentioned, it was pink (technically "rose gold" is what they were calling it) and it was two pieces, a corset bodice and the skirt. I was pretty skeptical and definitely knew I didn't want a pink dress. 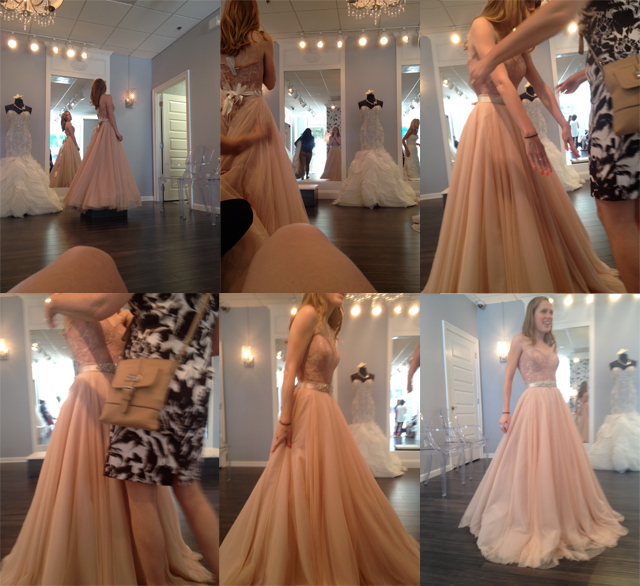 But then I put it on and I understood why those girls on Say Yes to the Dress always buy those blush colored dresses. It was so pretty and girly and special. I came out and felt like myself in it. It swished and moved just right when I stood in it, it was like a ballet skirt- made of super soft soft tulle-y material with raw edges, it wasn't heavy and it had these beautiful folds to make it fall and sweep the floor just right. It was so fun to wear. The corset had a sweetheart neckline and was covered in lace, almost in a two-tone manner. I stood on the platform looking at myself for a while and was totally surprised that I was falling in love with a pink dress. 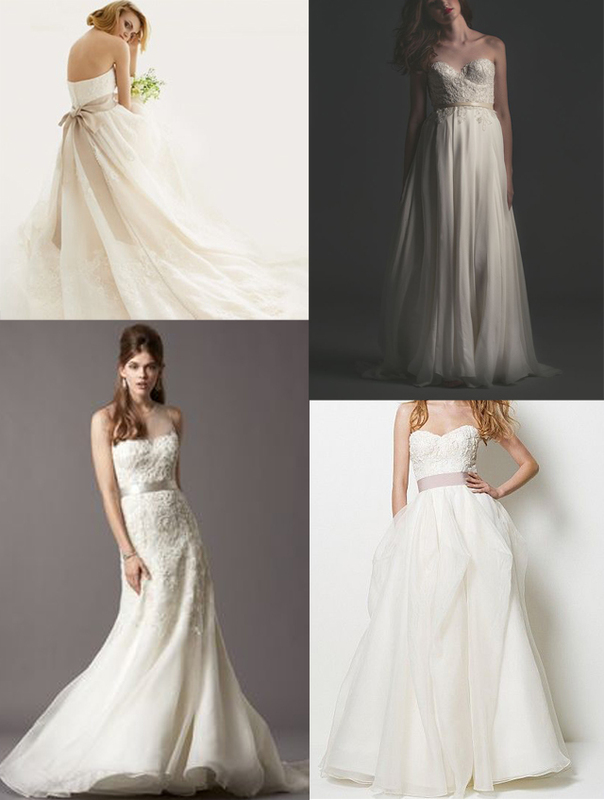 There were no pictures online of the dress in ivory, either on the designer's website, or on pinterest that we could find, and no fabric swatch, so I was a little nervous waiting for my dress to come and worrying that I wouldn't like it as much in ivory (though I liked that it wasn't a dress you were seeing everywhere). A few months later it arrived in the shop and I went with my mom and mema to try on my dress for the first time (read more about that day here). And I loved it even more in ivory! 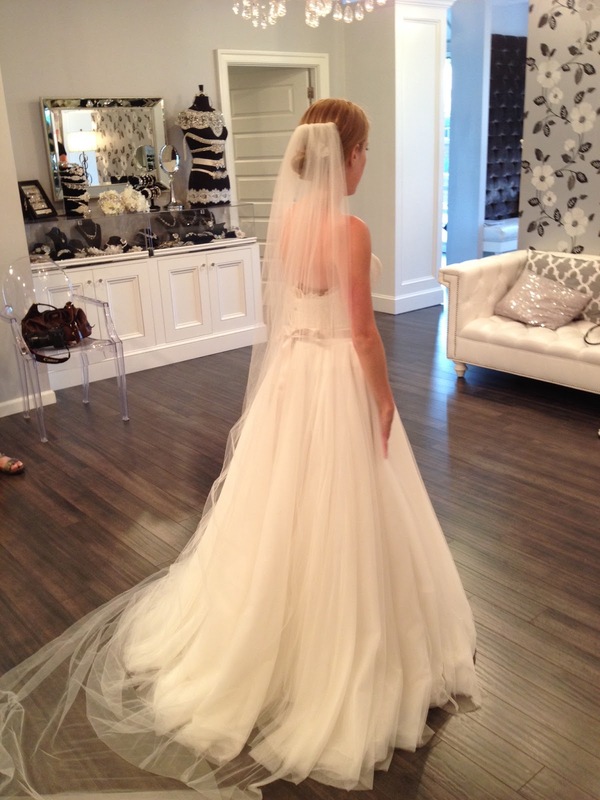 We also picked up a sash and a veil to complete the look and everything was perfect. It felt like a wedding dress! It felt like just what I should marry T.J. in. So after a hem and tuck, that's just what I did! **For your reference, it's a Watters gown. Along with the color choice, there were several other options you could select- I ordered my corset lined (of course), and the skirt without a train because I don't like bustles, though I did have my seamstress leave it a little longer in the back when hemming so it would still sweep. Beautiful, Shannon, and it's just what I imagined from your (and your mom's) cryptic description. :) You were a princess. I love the last photo, especially the way your mom and dad are looking at their little girl. :) Congratulations and God bless you and TJ as you begin your married life together.